Today’s recipe let’s you cheat a little on dinner. I don’t know about you but I could definitely use as many life hacks as possible to keep my sanity intact right now. This humble pan of roasted tomatoes with thyme and feta will transform a store-bought rotisserie chicken or a serving of pasta into a homey meal in a flash. And you hardly have to do anything to make it happen. It is perfect for those busy weeknights when you don’t feel like dealing with a complicated recipe but still crave a flavor powerhouse. Although I have written out a specific recipe, know that you can do everything by feel and still have it turn out pretty awesome. I don’t think I had ever measured out the ingredients for this dish until I wrote this blog post. One of the best things about this recipe is that it is so flexible. You can use tomatoes from the farmers market or the supermarket. You can use fresh thyme or dried. The only thing you don’t want to compromise on is the olive oil. Use a good quality olive oil because when the tomato juices combine with the olive oil and feta to create a sauce of sorts, you’re going to want an olive oil you like the taste of. If you’re not looking for dinner, these tomatoes also work as an appetizer. My favorite way to eat them is on some crusty bread that has been brushed with olive oil and lightly toasted. Top the bread with the tomatoes and feta and then drizzle on some of the sauce in the pan. Heaven. Now, I’m off to pack for a much needed vacation to a far away beach where I don’t have to think about project deadlines or dirty dishes. See you in a couple of weeks. Place the tomatoes on a rimmed baking sheet or in a shallow baking dish large enough to hold the tomatoes in a single layer. Drizzle evenly with the olive oil. Season with salt and pepper. Remove the thyme leaves from the sprigs and sprinkle evenly over tomatoes. Toss the tomatoes with the olive oil and seasonings until evenly coated. Roast the tomatoes until they start to burst and just start to brown, 10-15 minutes. 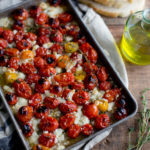 Remove tomatoes from the oven and sprinkle evenly with the crumbled feta. Turn on the broiler. Broil the tomatoes until the tomatoes and cheese have some nice browned spots, about 5 minutes. What a great way to use all the tomatoes in season. We have been loving these roasted tomatoes. I hope you get a chance to try the recipe.